Size: 2 in face, 2 1/2 stem, comes with nut & washer for mounting. Regular price: $15.95 ON SALE!! Drill a 5/16 hole. comes with nut & washer for mounting. "From Your Tire To The Fire" Tel-Tru's ROADKILL Thermometer - - Designed with Tel-Tru's unique pressure relief ring feature that is designed to prevent pressure build up in thermometer head while cooking in hot oven. This BBQ PIT GRILL THERMOMETER is for all you serious Bar-b-cuers. BBQ Smoker Thermometer Temperature Gauge. This works great on any grill or smoker. It is stainless steel and very easy to install as you just insert the stem through the hole on your pit or smoker and attach the washer and nut which are included. If your pit does not have a hole, you can just simply drill a hole and attach the thermometer as previously described. 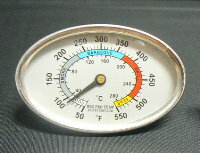 This is a great thermometer and I can say this as I use this very thermometer on my pit/smoker. 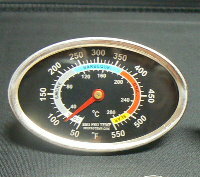 You will not be disappointed with this Gauge, Please feel free to ask any questions concerning this Gauge. BBQ PIT, GRILL / SMOKER Thermometers if Picked Up in Kansas City.